I am a mum of a fussy eater! Mealtimes used to be such a joy and then suddenly my lady became super fussy and cooking for her became a chore. I would always cook from scratch and make healthy and nutritious meals for her because she can't live on cheddar cheese sandwiches, watermelon and crisps everyday. Our weaning journey was great, we did a mixture of pureed foods and baby led weaning. All mealtimes would be freshly cooked, healthy and would include a variety of foods, each week we would introduce a new fruit and a new vegetable to try and introduce new flavours. But then she hit toddlerhood and as she started to gain independence she became very independent and knew what she liked and disliked. As a parent I know that getting use to mealtimes, new foods, strange textures and flavours can be troubling for any child. But nonetheless I wanted to try and provide my daughter with with a fresh and healthy diet. I can't even begin to tell you the number of hours I spend prepare good and nutritious food for my little one for her to push her plate away, it was so frustrating. But I have to keep in mind that most children go through a phase of only eating a few particular foods. This is a normal part of their development and that it's just a phase and will pass. I have been trying a few new ideas to help and encourage her to change her eating habits and they do seem to be working. 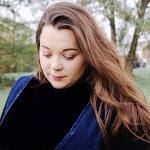 As well as all the struggles with mealtimes at home choosing healthy snacks to give my little one when we are out and about can be a completely minefield. We all know that being prepared is key but some days it’s just not possible to pack up enough snacks. Plans change, kids eat more than you realised and next thing you know you are searching for food in a supermarket! And they are by far not the greatest for healthy foods and snacks especially when the first counter you usually go by are sweet treats jam packed full of doughnuts, cookies and sweet pastries. But we try our best to make the right choices for her. 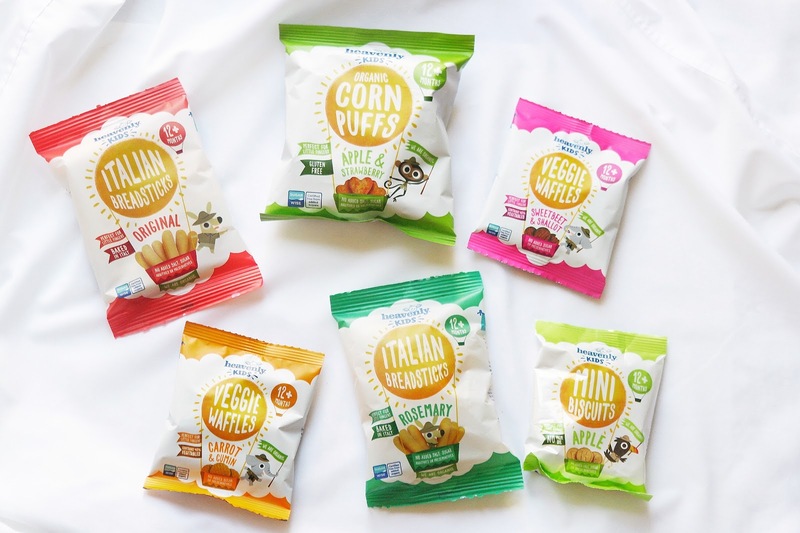 A relatively new discovery that we made for our little snack monster are Heavenly Tasty Organics who provide families with a wide range of healthy snacking products for babies and toddlers. Their products are Natural and Organic, using the best ingredients that they can source and made as close to what parents use in their own kitchen. Heavenly Tasty Organics believe that chemicals and fertilisers do not belong in children's foods and as you can imagine we couldn't wait to try some of their products. I was particularly impressed with the crispy veggie waffles – it’s so great to see a kids food company putting vegetables at the heart of what they do. I will always look for great ideas to add more portions of vegetables into her diet. Their veggie waffles are a bit hit with both the little lady and me. We had two flavours; Carrot & Cumin and Sweetbeet & Shallot. 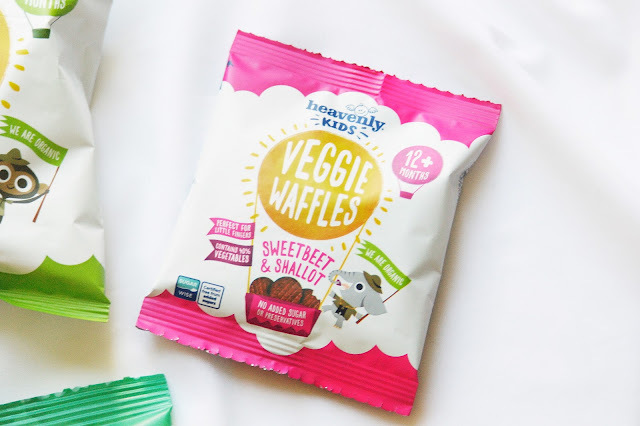 My daughter loved the fact that they were vibrant colours which made them much more appealing, these crispy veggie waffles are perfect for children from 12months. Their size and shape makes them perfect for little hands to hold and encourage self-feeding. Older children love them in their lunch boxes and adults have been known to nibble on them. These yummy veggie waffles contain 40% delicious organic vegetables and are perfect for snacking. There is no added sugar and no preservatives. Breadsticks have also been a firm favourite for snacking on the go for us from about six months old. We have the Italian breadsticks Original and Rosemary. These Italian breadsticks are made to a traditional recipe using only the finest organic ingredients, including extra virgin olive oil, with nothing added, not even sugar or salt. My lady loved the original ones but wasn't a great lover of the Rosemary breadsticks however mummy and daddy liked these ones. When my daughter was weaning she was obsessed with carrot puffs so I was glad to see something similar within the range with these Apple & Strawberry corn puffs. These are just as fun as those carrot puffs she loves, they were red in colour, heart shaped and they tasted pretty good too. 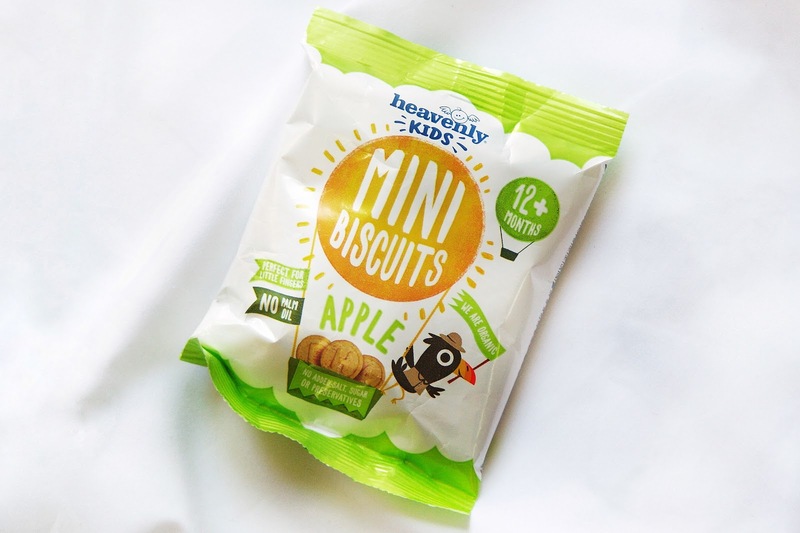 The last product we tried were mini apple biscuits. These are perfect for little fingers as they are completely organics, no palm oil, no added salt or preservatives. No added sugar - contains only naturally occurring sugars. Suitable for vegetarians. These tasty mini biscuits made from wholegrains and a touch of apple juice creating textures and tastes that kids enjoy. Their size and shape makes them perfect for little hands to hold and encourage self-feeding. Older kids love them in their lunch boxes too. Heavenly Tasty Organics range has really been a big hit with all of us as a family, actually as parents we are really impressed with the range. We love the fact that these products are organic, healthy option and help get extra portions of fruits and veggies into our daughter, being the fussy little eater she is it's a pretty big thing. The range has a wide range of variety ensuring they caters to all different tastes and texture from babies, toddlers, older children and even adults. All the snack prepared from Heavenly Tasty Organics are all calorie controlled, no preservatives, no salt, no palm oils and only include naturally occurring sugars. 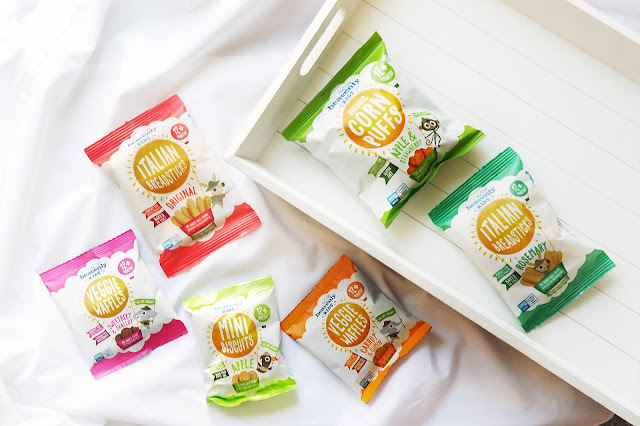 And what makes these little snacks even better is that they are perfect for parents and children on the go, as we know how easily it is to make the wrong choices when it comes to convenience. Have you tried anything from the Heavenly Kids range? If so, what were your favourites. 20 comments on "Heavenly Kids: The Perfect Snack on the Go "
These snacks sound like such a good idea. I know my sister in law really struggles with my neice in public when she gets fussy so I’ll be telling her about these! Oh yes these are a good option. Ah, I love the Heavenly breadsticks! So good - perfect to dip in houmous. The veggie waffles are great too. I just love having little packets of snacks to keep in my bag for those out-and-about snack emergencies. Makes life so much easier. Oh I will have to try that one. Sounds like a good option for me, haha, little lady isn't a fan of houmous. Ooo I'll have to check these out they sound fab for packed lunches for ru! I'm sure he'd love them. The waffles are good. I love yummy but healthy snacks! Ah you are welcome. You'll have to let me know how you find them. She really liked the waffles. We’ve not tried these but I bet Tyler will love them! I think they are so good for little ones. This is awesome! I'm always looking for convenient but healthy snacks. These are a great option. We love these! We have a large collection of them in the snack box! Oh yay! Which are your favourites? I've been seeing these about lately and they look fantastic, my two would gobble them down for sure.